You are here: Home / Baking 101 / Chocolate Ganache 101: Ratios, Uses and How To! 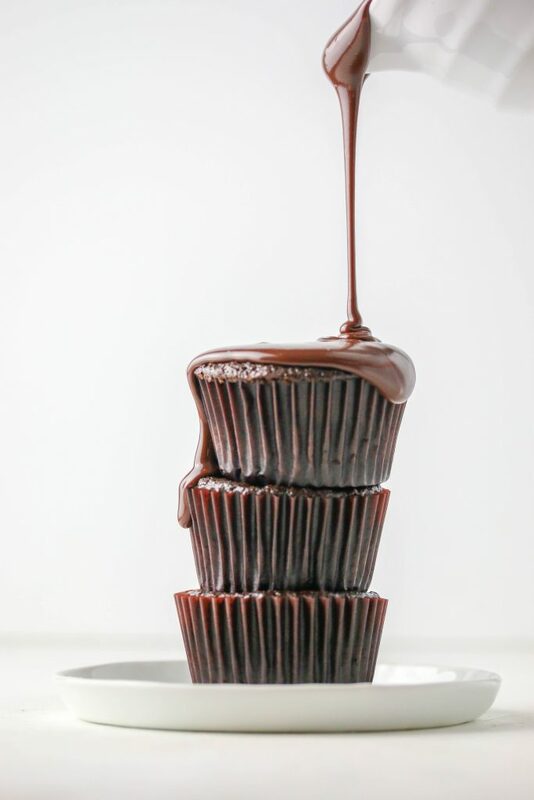 Chocolate Ganache 101: Ratios, Uses and How To! Learn how easy it is to make chocolate ganache. 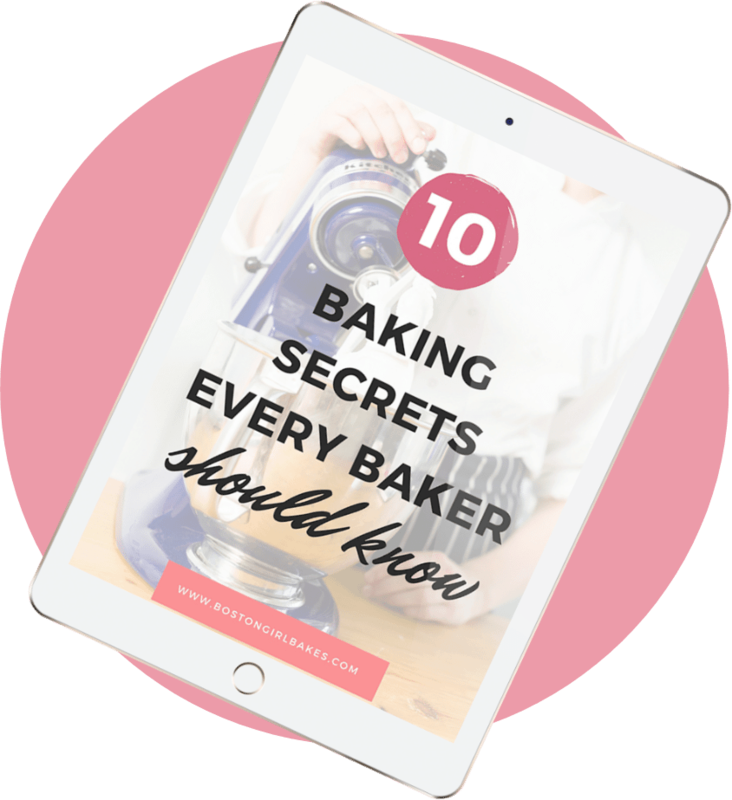 Then learn the basic chocolate ganache ratios, different uses for ganache, and of course step by step photos on how to make it! Ganache simple, decadent and versatile. I remember one of the first times I made ganache. I was expecting some overly complicated recipe. I mean ganache. The word alone obviously beckons for difficulty right? Oh but it seriously wasn’t at all. The thing I love about ganache is its versatility. 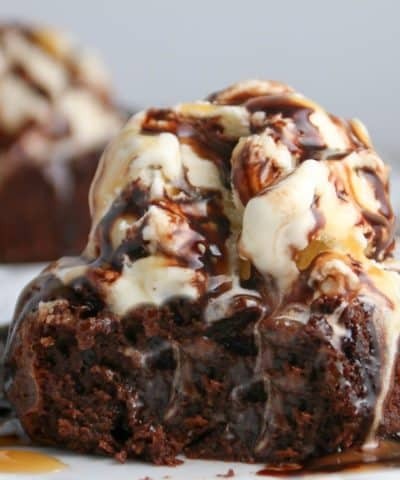 You can use it as a glaze, turn it into a truffle, or whip it into a gorgeous chocolate frosting. 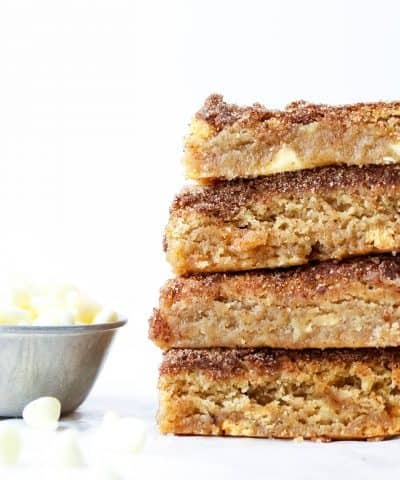 With just 2 ingredients! By simply playing around with the ratios you have a recipe in your backpocket for years to come. Chocolate Ganache. Demystified. Let’s do this. Let’s start with the basics. What on earth is Ganache. First of it’s pronounced Guh-“nah”sh. There English lesson over. Ganache is simply chocolate and cream combined. Yup that’s it. The cream will be heated and then poured over the chocolate allow it to melt. And then it’s whisked together into a velvety smooth sauce. 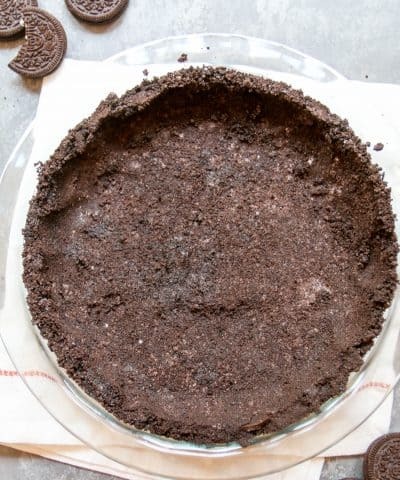 From there you can turn it into a filling, a glaze, truffles, and so much more. How Do I Make Ganache? Step 1: Chop your chocolate. 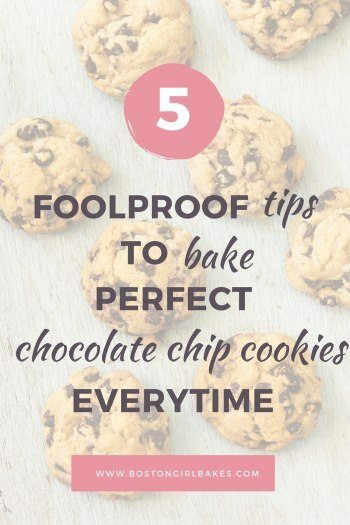 Or as I often do, use quality chocolate chips to make this go even faster. I’ve made it both ways and both times it turns out perfect. So you choose. Chop or chips. Just make sure you choose quality chocolate. It will make a difference. If you do use chopped chocolate- make sure they are chopped small enough so they melt quickly once the cream is added. I always use a dark bittersweet chocolate. 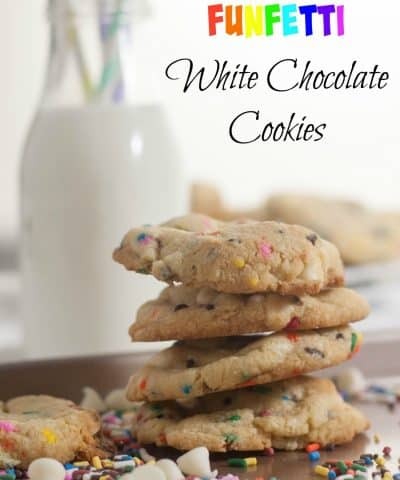 Milk or white chocolate can be more likely to be damaged from the heat because of the added milk. 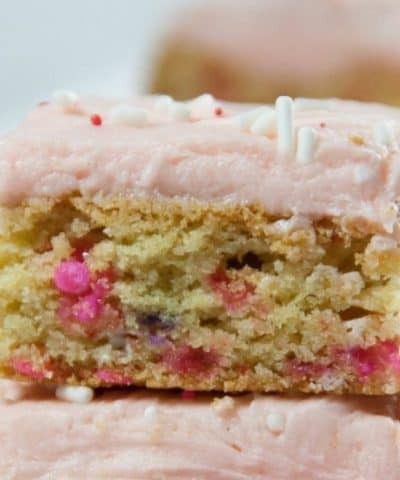 If you do use milk or white chocolate then you may need to reduce the amount of cream. Make sure regardless though you use quality chocolate because this only contains 2 ingredients. Your cream needs to be heated in order to melt the chocolate. You want the cream hot, but not boiling. You can do this in a saucepan and heat until it’s simmering. Or in your microwave. Just be careful if you use the microwave method. It can boil over. I like to microwave it in 30 second intervals and check. Once the cream is hot enough, then pour it over your chocolate. Let the mixture sit for 5 minutes before stirring. If you are making a small batch, then you may not need to wait as long. I always wait 5 minutes on average. Allowing the cream to sit will bring the temperature down, while also melting the chocolate. If you stir right away, it could cause the ganache to break resulting in a grainy texture. Step 5: Stir Until Smooth. Once the mixture has been allowed to sit, then you can stir it together until smooth. Start by whisking slowly in one direction . This can take a few minutes for the mixture to come together. It won’t seem like it will at first but it will smooth out. 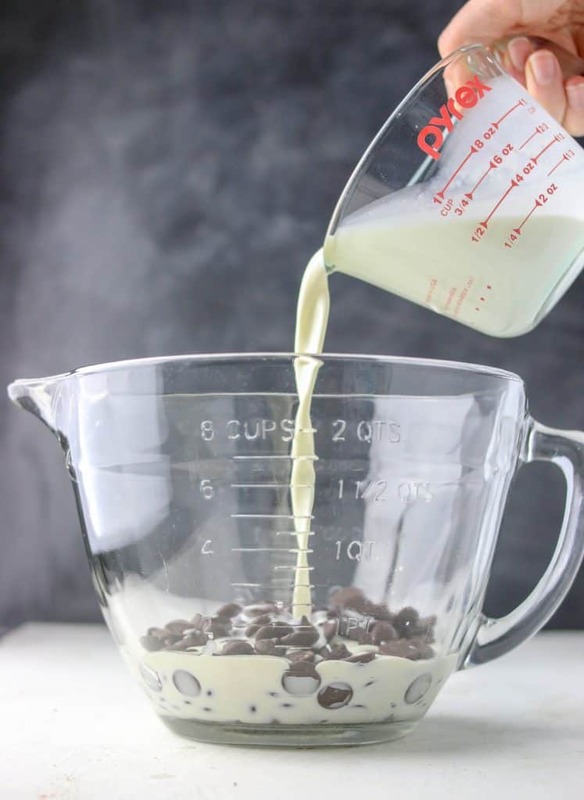 Now that you have the basics down you can play around with the ratios of cream to chocolate to make all sorts of things! This is my go to ratio because I can then turn it into so much. The consistency will be very thick (almost pudding like). 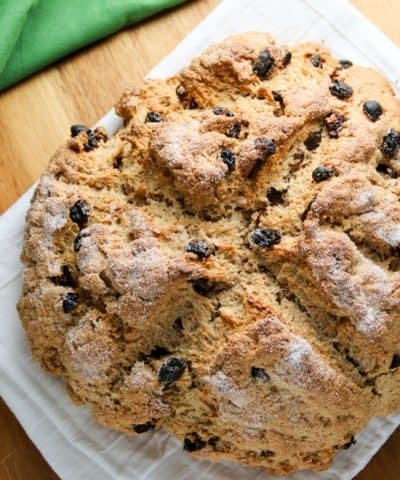 Uses: Glaze for cake like this Dark Chocolate Guinness Cake for St. Patrick’s Day. I can also simply allow it to cool and then whip it into a chocolate ganache frosting. 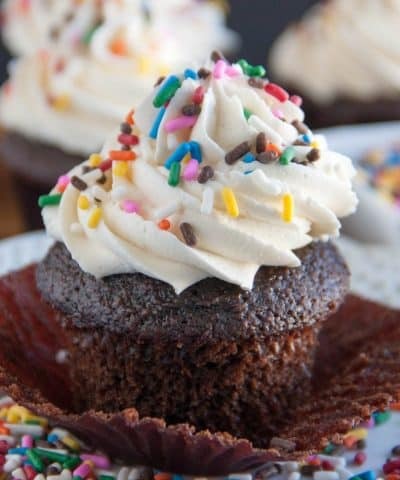 Perfect for a filling in a cake like this Chocolate Coconut Cake Recipe or to frost cupcakes like these Boston Cream Pie Cupcakes or Triple Chocolate Cupcakes . I have even used this ganache to make these Boston Creme Pie Macarons. This ganache will be much thinner perfect for pouring and using as a thin glaze. It will harden up as it cools, but while it’s warm its perfect for dipping. Uses: This can be used to pour over a cake or use to dip into fruit like these chocolate covered strawberries or even better how about some fried donuts? This ganache will be very thick and almost fudge like. 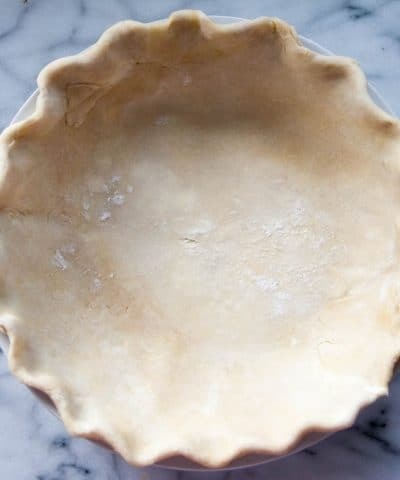 You could use this as a filling for a tart or a macron! Uses: This is perfect for making truffles. 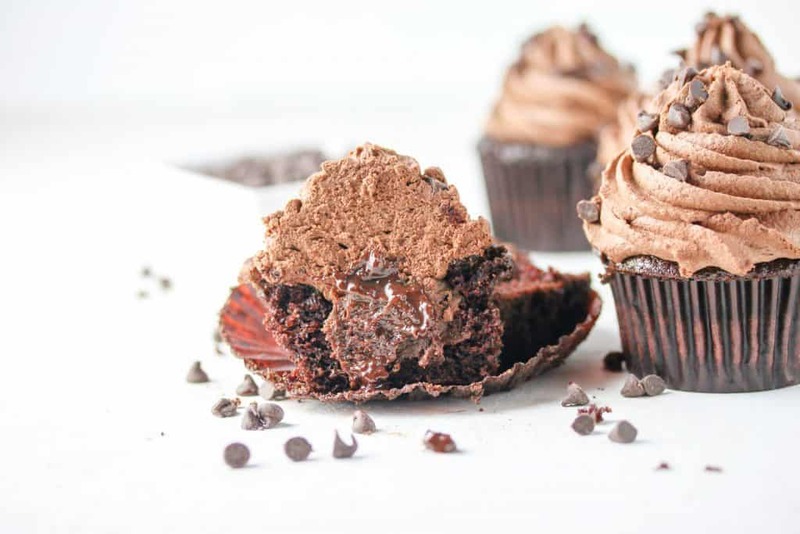 Check out this Ultimate Truffle Guide from Handle The Heat. Can Ganache Stay At Room Temperature? Ganache can stay at room temperature for up to 2 days. It just needs to be kept in a cool place. Just cover with a plastic wrap that touches the surface so it doesn’t form a skin. 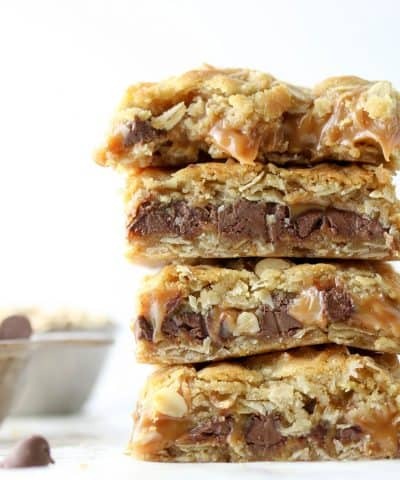 How Do You Make Ganache Thicker? Ganache will seem thin and runny in the beginning. It will thicken as it cools. If you want a thicker ganache or you find yours is too thin even after cooling, then simply warm the ganache and add in more chocolate. You can also thicken it by allowing it cool then whipping it. How Do I Store Ganache? You can store the ganache at room temperature for 2 days. Be sure to cover the ganache with plastic wrap. Make sure the plastic wrap is touching the surface of the ganache so a skin doesn’t form. Ganache can also be frozen for up to a month! Why Did My Ganache Split? This can happen. Ganache is essentially an emulsion, meaning 2 ingredients that don’t want to be together are forced together. Think mayonnaise! A broken ganache can happen when the cream is too hot causing the fat in the chocolate to seperate. This will result in an oily and grainy ganache. To avoid this make sure that your cream isn’t too hot- do not let it boil but just simmer. 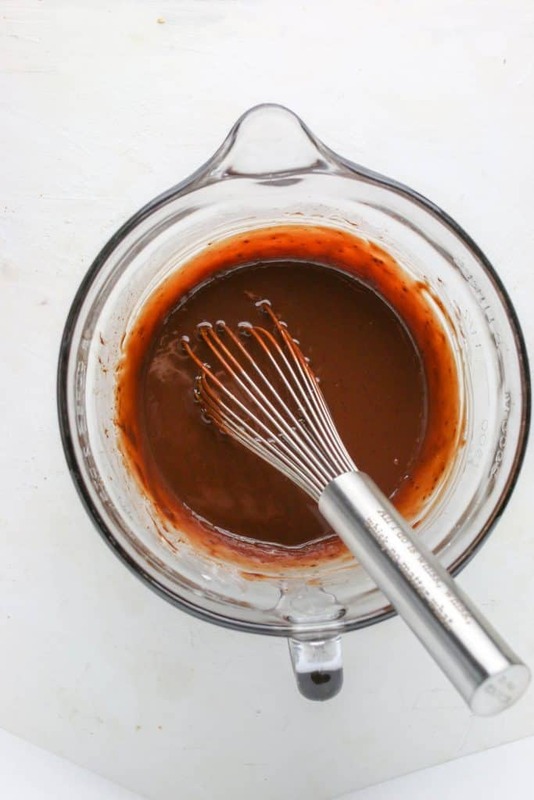 For more tips check out this great post from Philosophy Of Yum –> How To Fix A Broken Ganache. 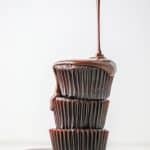 With just 2 ingredients you can make a chocolate ganache that can be used for fillings for cakes, glazes, dipping, and even turned into an amazing frosting! Chop the chocolate and place in a glass (or metal bowl) and set aside. 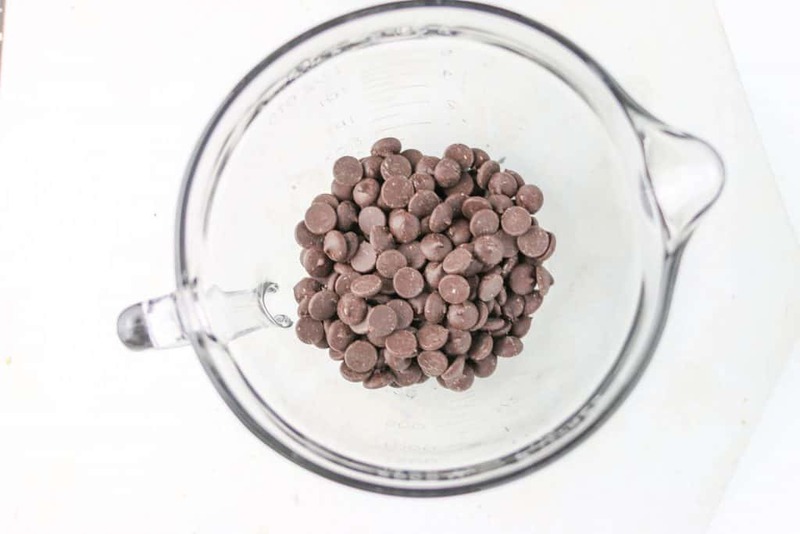 If you are using chocolate chips, you can just measure and place in the bowl. In a saucepan heat the cream gently over low heat until simmering. If you want to use a microwave, heat for 30 seconds to 1 minute in a microwave safe bowl. It can bubble over so be keep a close eye! 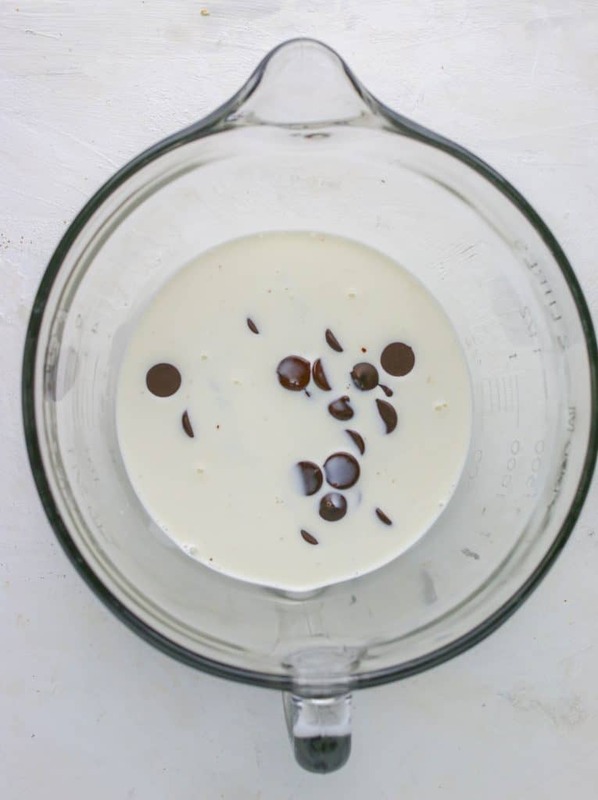 Once the cream is heated, then pour the cream over the chocolate and let the mixture sit for 3-5 minutes. Then whisk until smooth. 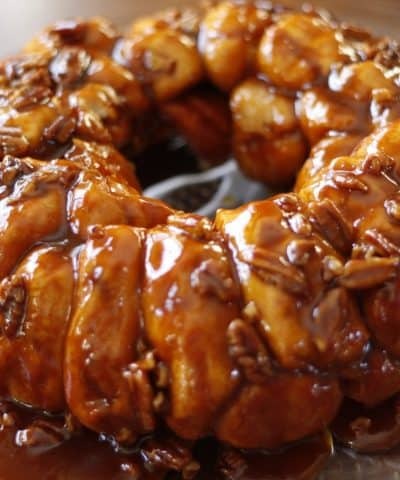 Start slowly with the whisking and whisk in one direction. This can take a few minutes. Then allow to cool slightly before using. If you want a thicker ganache, allow it to cool for longer. 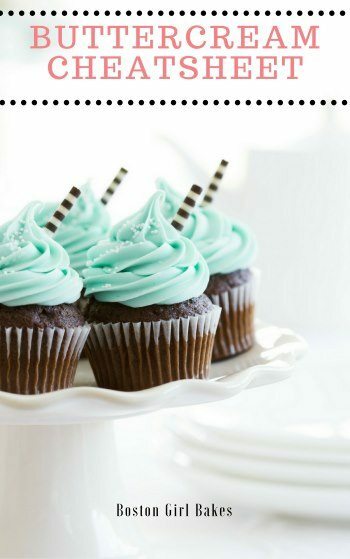 If you want to turn into a frosting, allow to cool completely then mix in a mixer until light and fluffy. Do not let the cream boil. The cream will be too hot then and cause the fat in the chocolate to seperate resulting in a broken grainy texture. Make sure to let the ganache sit for 5 minutes before whisking. Then whisk slowly at first and in one direction. You can store the ganache at room temperature for 2 days. Be sure to cover the ganache with plastic wrap. Make sure the plastic wrap is touching the surface of the ganache so a skin doesn't form.